This verse wouldn't have occurred to me had I not read it today. But, yes, in my situation, I need this. 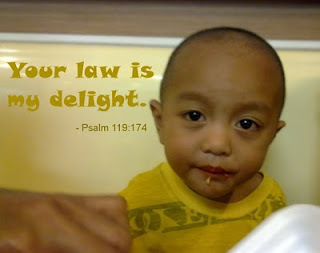 "I long for your salvation, O LORD, and your law is my delight." How I long for Your salvation. What a cute photo! The verse is convicting and something we need to continually remind ourselves. Have a blessed WFW! Oh sweet shot and great verse for today. Happy word-filled Wednesday. Mine is up too. I always think of Beth Moore asking God to delight her and then showing her a baby bear and her running, so excited that she got her delight. But I also know that God delights me...sometimes I'm too busy to notice. I wonder how many times He's put things in motion to delight me and I didn't see them.